I actually have no problem with this. In fact, I am very much on board with this. All it conjures up is old memories of Willow, and I don't think that's a bad thing at all. Yeah, this isn't really a bad thing. It's a shame to see Lord and Miller leave the project, especially so late in the shooting schedule. But Ron Howard isn't a bad director. The biggest complaint I could give is that sometimes he's kind of a boring director. But that isn't the worst thing they could do. It's not like they hired Paul WS Anderson or something. Was hoping Joe Johnston would get picked. That would be good. Or, hell, give it to Patty Jenkins! I have never seen a Ron Howard film and thought it was better than adequate. Often AWFUL. The other thing is it is extremely bizarre for such a high profile director to step into a mostly completed film. If they are calling in a director like that, it might not be as complete as they are letting on. When the news broke the other day that Lucasfilm had fired the directing team of Phil Lord and Chris Miller off its Han Solo spinoff flick, a few things came to mind. First and foremost, there was the shock of a major project like this making such an enormous move, especially, ahem, five months into shooting. Han Solo is handsome. He's not a pretty boy. There's a difference. 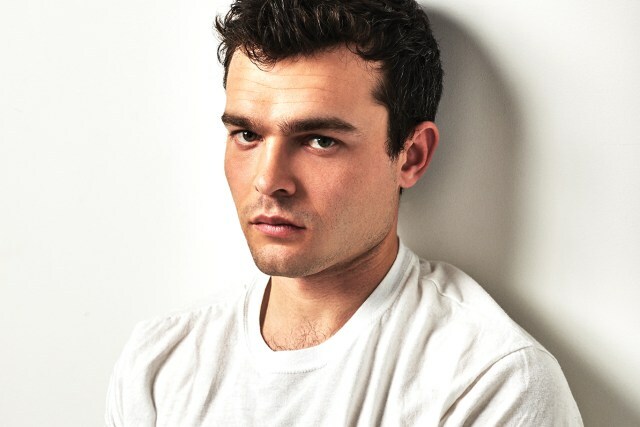 I think Alden Ehrenreich is a mix between the two. If he gets a broken nose then maybe. He's got to lose the boyish voice too. Harrison never had a boyish voice since he was a boy. They should cast young men from cattle ranches or Australia. New details emerge from the set of the troubled Han Solo movie (an editor fired, a last-minute acting coach hired) as insiders debate whether problems trace to directors Phil Lord and Chris Miller, or if the Disney and Lucasfilm series can accommodate divergent styles. Matters had already reached a boiling point in mid-June when Phil Lord and Chris Miller, co-directors of the still-untitled young Han Solo movie, were in the cockpit of the Millennium Falcon but didn’t start shooting until 1 p.m. That day the two used only three different setups — that is, three variations on camera placement — as opposed to the 12 to 15 that Lucasfilm president Kathleen Kennedy had expected, according to sources with knowledge of the situation. Not only was the going slow, but the few angles that had been shot did not provide a wealth of options to use in editing the movie. This was hardly the first time Kennedy was unhappy with how the film was progressing. And as he looked at dailies from his home in Los Angeles, Lawrence Kasdan — screenwriter, executive producer and keeper of the Stars Wars flame — also was said to be displeased. Meanwhile, Lord and Miller, the exceptionally successful team behind The Lego Movie and 21 Jump Street, were chafing, too, according to a source close to them. There were "deep fundamental philosophical differences" in filmmaking styles, this person says, and the directors felt they were being given "zero creative freedom." They also felt they were being asked to operate under "extreme scheduling constraints" and "were never given enough days for each scene from the very beginning." Shortly after the shoot in the Millennium Falcon, on June 20, the world learned that Kennedy — with the backing of Disney studio chief Alan Horn — had taken the extraordinary step of firing Lord and Miller. Obviously, Kennedy knew this would set off a storm of publicity that no one wants or needs in any movie — especially one in the Star Wars universe, where every move is closely watched by a gigantic audience with a sense of ownership. It's rare and undesirable enough to fire any director. Firing established players like Lord and Miller, who have a fan base ready to give them the benefit of any doubt? That shocked Hollywood's most seasoned veterans. Anxious to avoid an outright rupture, Kennedy is said to have made attempts first to support and eventually to supplant Lord and Miller to some degree, as happened with Gareth Edwards on the troubled Rogue One. In that case, screenwriter Tony Gilroy took on significant duties with the cooperation of Edwards; in this case, sources say, Kennedy attempted to cast Kasdan in that role. Unsurprisingly, Lord and Miller were less accommodating than Edwards, still a novice, had been. Lord and Miller declined to comment, as did Kennedy. As soon as shooting got underway, insiders say, it started to become clear that Kennedy’s stated intention of hiring directors who would put their own spin on Star Wars movies had led to a mismatch. Some insiders say that while the talent of Lord and Miller is undeniable, nothing in their background prepared them for a movie of this size and scope. These sources say they relied too heavily on the improvisational style that served them so well in live-action comedy and animation but does not work on a set with hundreds of crewmembers waiting for direction. “You have to make decisions much earlier than what they’re used to,” one of these sources say. “I don’t know if it’s because there were two of them but they were not decisive.” Production department heads began to complain. While the pair appeared to listen when told of festering problems, this person says their approach did not change. But the source close to Lord and Miller acknowledges they have always worked in an improvisational style and not just to add comedic elements. "They collaborate closely with their actors and give them creative freedom that, in their experience, brings out the actors' best performances," this person says. "Lawrence Kasdan would not allow this and demanded that every line was said word for word. To appease him and the studio, Lord and Miller would do several takes exactly as written and then shoot additional takes." Matters were coming to a head in May as the production moved from London to the Canary Islands. Lucasfilm replaced editor Chris Dickens (Macbeth) with Oscar-winner Pietro Scalia, a veteran of Ridley Scott films including Alien: Covenant and The Martian. And, not entirely satisfied with the performance that the directors were eliciting from Rules Don't Apply star Alden Ehrenreich, Lucasfilm decided to bring in an acting coach. (Hiring a coach is not unusual; hiring one that late in production is.) Lord and Miller suggested writer-director Maggie Kiley, who worked with them on 21 Jump Street. When Kennedy felt that these measures did not get the production on track, she asked Kasdan to come to London. Kasdan is said also to have been unhappy with the limited shots and displeased that Lord and Miller were calling out lines for the actors to try from behind the monitor rather than sticking with the script that he had written in collaboration with his son. (Lord and Miller had input on the script before shooting began.) “As a writer, producer and part of Star Wars world, you get on a plane when that happens,” says a person with knowledge of the situation. But Lord and Miller were not prepared to have Kasdan become a shadow director. With an impasse reached, Kennedy finally pulled the trigger. The next day, when the crew was told that Ron Howard would take over as director, sources say they broke into applause. But an insider argues that Rian Johnson (Looper) shot Star Wars: The Last Jedi, set for release in December, seamlessly, proving that the right director can execute without major interference from Lucasfilm. The search for new and interesting filmmakers will continue and for many, perhaps, the siren call of Star Wars will be impossible to resist.